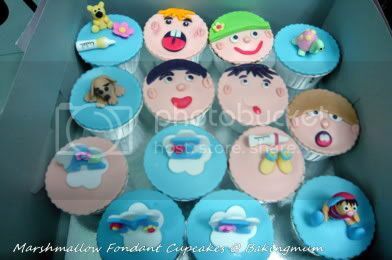 I had to make a batch of marshmallow fondant covered cupcakes for a friend's nephew's first month celebration today. I had to do another batch for my son's classmate's birthday celebration today too. 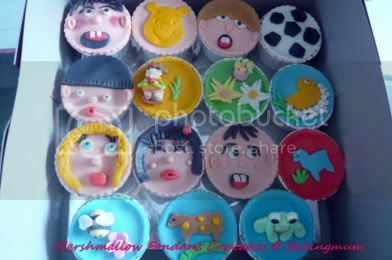 Was too busy making the sugarpaste toppers this whole week that I have not updated my blog at all. 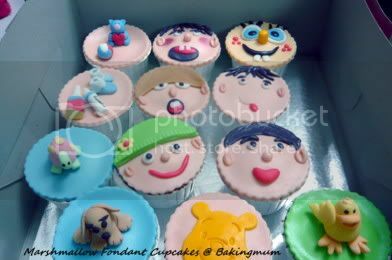 Sharing with you how the cupcakes was decorated. All are lovely.Love the Sponge Bob one best. Thanks! I am the birthday boy Brendon's mom ..your cupcakes were amazing! The kids love it..we can't get enough. Hi Yvonne, I was so surprised to see your comments on my blog. 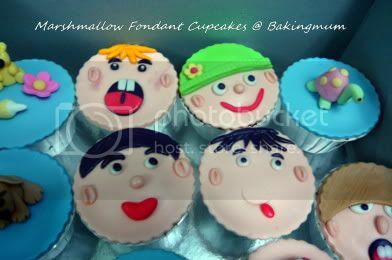 I guess my son must have told you about my blog :) So happy that the kids enjoyed the cupcakes. Thanks for your feedback too. Appreciate that. How cute, too pretty to eat! 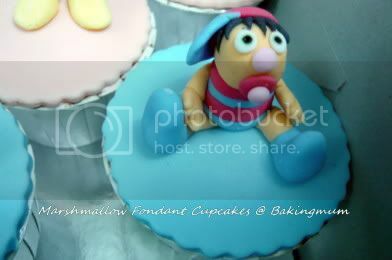 And comments mention that they are not too sweet esp for children. I would like to bake them for my son's birthday. Could you share with me the recipe for the cupcake. Do you melt the marshmallow for the topping? 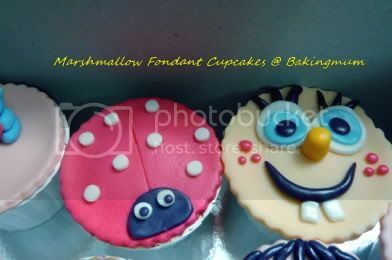 Mei, the recipe for the marshmallow fondant is in my blog. 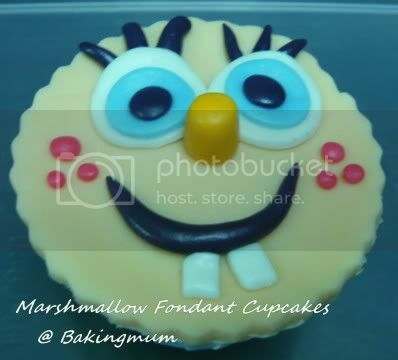 You can use the vanilla cupcake recipe in my blog too and use the chocolate ganache which I have post together with the moist chocolate cake to frost the cake before putting on the marshmallow fondant. 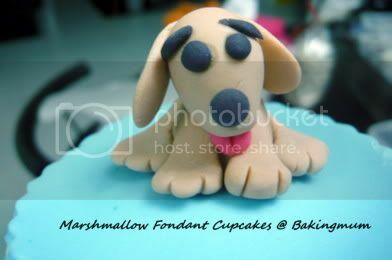 Hi Hugbear, just to ask do you conduct any classes for making the fondant figurine? Thank you. 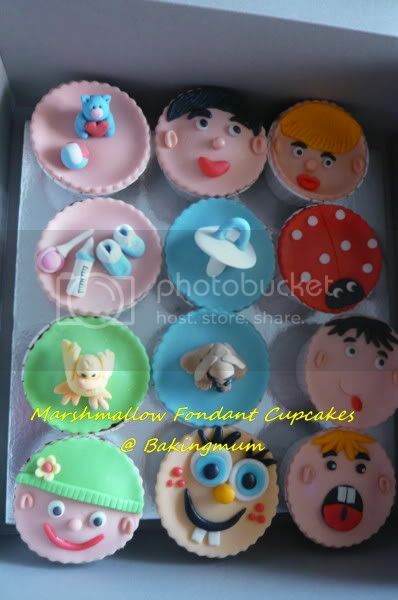 I do conduct classes for the MM fondant cupcakes but not for the sugarpaste figurines. 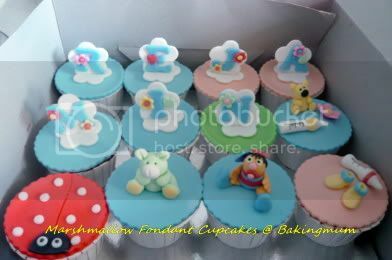 Im interested to attend the Fondant cupcakes so is it too late to register now? Hi onghkee, I will be conducting another class on Nov 8. If you are still interested and can make it, you can email me at leeleet@gmail.com and I can give you more details. Hi Michelle, I will email you with details. This is Yvonne, Brendon's mum again. I just want you to know that your son's a lovely boy and he is so proud of you. : ) He told all abt your blog, your cooking and how busy you are but still manage to do all this. What a compliment from your own son! Shows that you're not only a great baker but a fantastic mum too. Well done! so cute and look great! may i know where to find your moist chocolate cake recipe ? i am looking for your choc ganache actually ... thanks millions !!! !